The evening street lights glow along the Rue Notre-Dame in Old Quebec in Quebec City, Canada as the rooftop of the Fairmont Le Chateau Frontenac adorns the backdrop. A golden glow from the lights along the Rue Notre-Dame in Old Quebec in Quebec City, Canada during the evening hours makes the aura around the street very romantic. Towering above the street, is the top half of the elegant Fairmont Le Chateau Frontenac where your accommodations are very luxurious. 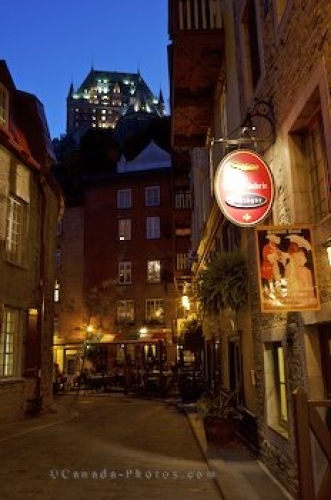 Fairmont Le Chateau Frontenac seen at blue hour from rue Notre-Dame in Old Quebec, Quebec City, Quebec, Canada. UNESCO World Heritage Site. Picture of the evening street lights along Rue Notre-Dame in Quebec City.